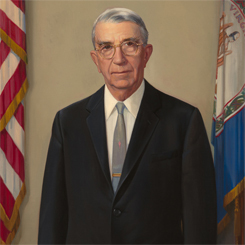 About this object Howard Smith of Virginia, chairman of the House Rules Committee, routinely used his influential position to thwart civil rights legislation. Smith often shuttered committee operations by retreating to his rural farm to avoid deliberations on pending reform bills. On this date, Howard Smith of Virginia, chairman of the House Rules Committee, introduced the Southern Manifesto in a speech on the House Floor. Formally titled the “Declaration of Constitutional Principles,” it was signed by 82 Representatives and 19 Senators—roughly one-fifth of the membership of Congress and all from states that had once composed the Confederacy. It marked a moment of southern defiance against the Supreme Court’s 1954 landmark Brown v. the Board of Education of Topeka (KS) decision, which determined that separate school facilities for black and white school children were inherently unequal. The Manifesto attacked Brown as an abuse of judicial power that trespassed upon states’ rights. It urged southerners to exhaust all “lawful means” to resist the “chaos and confusion” that would result from school desegregation. Smith had cooperated with several Senators to develop the Manifesto, and Walter F. George of Georgia introduced it in the other chamber. Under Smith, the Rules Committee became a graveyard for numerous civil rights initiatives in the 1950s. In his prefatory remarks, Smith declared that the ship of state had “drifted from her moorings,” and described the high court’s record on civil rights as one of “repeated deviation” from the fundamental separation of powers and constitutionally implied autonomy of the states. A small group of southern Members rose on the House Floor to applaud Smith’s brief speech; no Member rose to speak against it.